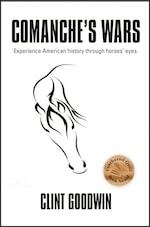 Award-winning Comanche's Wars is told through the eyes of a horse - a young black stallion from Virginia - embarking on a journey of self-discovery during America's aggressive push to the West. Stonewall's journey will parallel a nation's heritage that embraces triumphs and defeats on the battlefields. Together, human and horse witness and experience struggles for their lands, cultures, traditions, and ways of life. Award-winning author Clint Goodwin spent his childhood working on a small cattle ranch in Mineral Wells, Texas. Raised by Great Depression–era parents, Clint’s life would become a story in itself. As a WWII veteran, his father, Russell shaped Clint’s disciplined thinking. Clint’s mother, Jolene raised him and his three siblings while Russell was away working much of the time. Jolene defined Clint’s love for people and life. Together, both parents forged Clint’s confident views on living, and balanced it with reality. In the ’60s, Clint thought his future would be reins in one hand and a rope in the other. During the mid-1970s, he traded them in for a pen and weapon. He would travel the world supporting combat operations as a sailor and senior naval officer.